The media had finally awakened to a problem that we have already identified and begun to aggressively treat. In addition to using floss and other personal oral hygiene products, we now use lasers to kill the bacteria associated with gum disease, inflammation and infection. Laser Bacterial Reduction (LBR) enables us to destroy the bacteria that cause inflammation and periodontal disease. 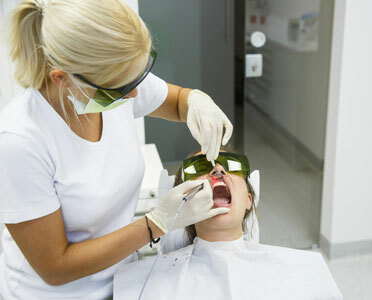 In other words, just by circling the teeth with the laser, we can drastically reduce the harmful bacteria that can compromise our dental and overall health. The application of the laser can take bacterial counts around an inflamed periodontal pocket from billions down to hundreds within seconds. Downtown Dental uses lasers to attack periodontal inflammation at the microscopic level of infection. The power of its focused light destroys otherwise inaccessible bacterial colonies while simultaneously creating an ideal environment for healing. Today, our practice offers our patients the hope of a better tomorrow by providing oral health care in ways that were science fiction only a few years ago. We are not only cleaning teeth and creating beautiful smiles: with our progressive dental laser therapy, we are enhancing your lifestyle and hopefully prolonging your life. Hear one patient’s story of Laser Bacteria Reduction (LBR) to treat gum infection.